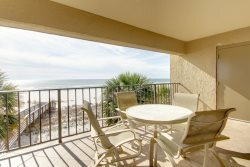 Perdido Skye, the affordable condo is directly on the beach with amazing views from your large beachfront balcony. Youth-size captain’s bunks built into the hallway allow extra sleeping for children. This 700 SF, 4th floor unit overlooks the large pool and has beachy decor with ceramic tile throughout. Electronics include 42” Flat screen TV, DVD in Living Room and 32" Flat screen TV in Bedroom. Other than the weather, the condo was perfect! Beautiful view from our room! Condo was perfect size for us on our honeymoon! Positive all the way around. Valerie made our short notice get away a breeze.